This article will walk you through the steps of how to set up your Position Tracking campaign. In order to run a Position Tracking campaign, you need to have an active Project. 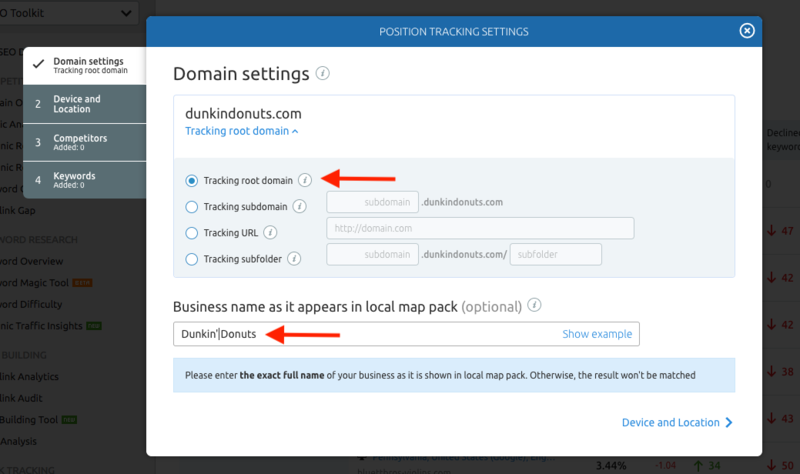 If you have an existing project without a Position Tracking campaign set up, you can set up a Position Tracking campaign for that domain in your pre-existing Project. Or, create a new Project and set up your Position Tracking campaign first. Please note: In order to delete a Position Tracking campaign, you have to delete the entire Project. You cannot delete a Position Tracking campaign once it is set up without also deleting the rest of your Project tools. However, you can re-configure the keywords and competitors in your Position Tracking campaign at any time. In the first step of the configuration window, you’ll see the root domain of your project listed by default. If you open the Advanced settings drop down, you’ll see that you also have the ability to track a subdomain, URL, or subfolder on your website. To get the most data possible, we recommend that you start by tracking the entire root domain. But don’t worry! You can change these settings at any point after starting your campaign. If you know that you want to focus on a specific area of your site, you can enter the subdomain, URL, or subfolder of your focus to narrow the campaign’s scope. However, all rankings on subdomains, URLs, and subfolders will be stored in your historical data anyway. Therefore, it’s best to start by tracking the root domain and experiment with looking at subdomains and URLs after your campaign has begun. In order to track your website's local pack results, we need you to provide your business name EXACTLY the way it will appear in the local pack. This means not abbreviating or shortening your business name, or misspelling your name. With this information, we can identify all of the keywords where your business has a ranking in a local pack if you're tracking local keywords. The second step of the wizard allows you to specify the location and device type of the search results you want to track. You can set up a campaign to track results specific to a country, state/region, city, or zip code. 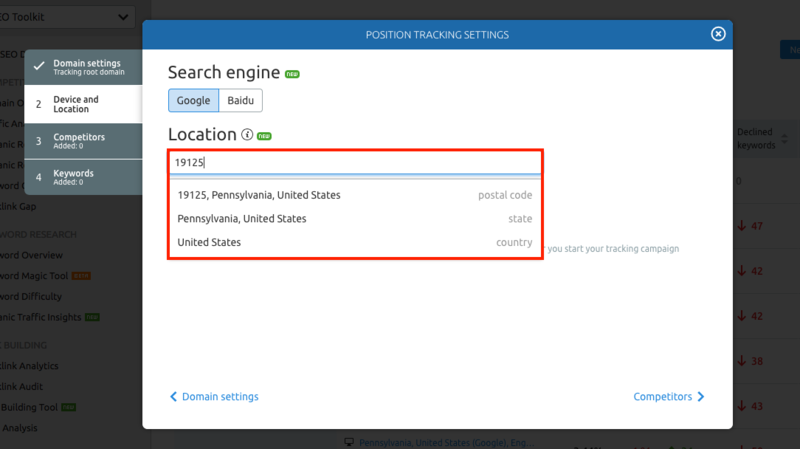 To set the target location for your tracking, simply type the name of the country, region, city, or zip code into the form. 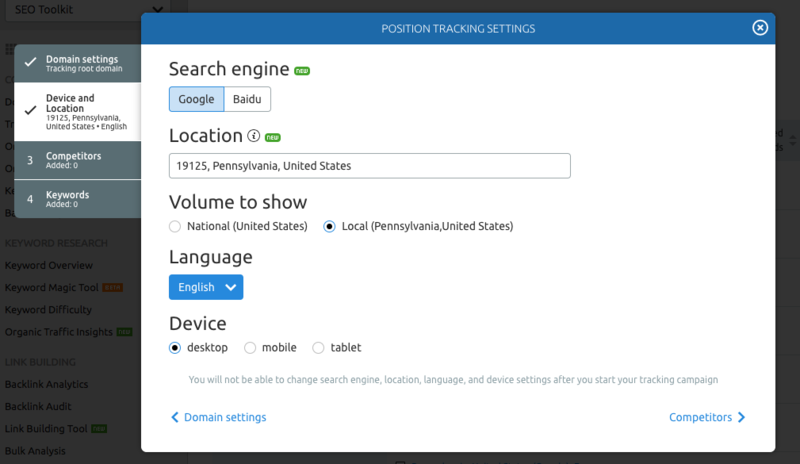 After entering your location, decide if you want Position Tracking to display the local or national volume (daily search volume in the location) of your keywords. Once your Position Tracking campaign is running, you can toggle local and national volume back and forth. For local businesses or any location-specific campaigns, this step is vital for focusing the tool to track results in the areas you’re actually targeting with your website. You can also choose to change your search engine between Google or Baidu if you want to track search results in China. Baidu tracking was released in the Spring of 2018, as we continue to expand into the Chinese market. Check out our news article about tracking your keywords with Baidu here. As of now, tracking results on Baidu is available on the national level only. At this time, SEMrush Position Tracking does not cover Bing results. Next, you can choose the type of device to track results on. Search results are different from desktop, mobile phones, and tablets so select the device that you want to track your marketing efforts on the most. To cover all three device types, you can add additional device types (and locations) to track in your campaign after its initial setup. Please note: After setting up your campaign, you will not be able to change the original location or device type, so double check your settings in this step before moving on. However, if you set up a campaign on the local (city) level, you will be able to switch between viewing local and national volume data in your campaign. In the next step of the wizard, you can add up to 20 of your competitors to your campaign. SEMrush automatically generates a list of suggested organic and Google Ads competitors for your domain. These suggested competitors are generated from our Organic Competitors and Advertising Competitors reports under Domain Analytics. The tool will track rankings for each competitor added in addition to tracking your own domain. After your campaign begins, you can add or remove competitors at any time, so there’s no pressure to include every relevant competitor in the setup. In fact, there will be a tab called Competitors Discovery in the tool to provide you with even more suggested competitors based on the keywords in the project. The suggested competitors in the Competitor Discovery tab will ultimately be more accurate because they’re based on who competes for traffic from the specific keywords you’re focusing on. Finally, you can enter your target keywords in the wizard. Your options are adding keywords manually, from SEMrush reports, from Google Analytics, or from a .txt or .csv file. When adding keywords from SEMrush, you have the option to add lists of keywords from an Organic Positions report, Advertising Positions report, Phrase Match keyword report, or Related Keywords report. Importing from Google Analytics will add your list of keywords found under Acquisition - Campaigns - Organic Keywords to your Position Tracking campaign. When uploading the .csv file, make sure to include all of your keywords in the first column. Any info in other columns will not be imported. When you add keywords to your sandbox, you have the ability to tag groups of keywords before adding them to the project. The more specific you are with the tags you apply to the keywords in your campaign, the easier it will be to analyze your rankings for different keywords as your campaign progresses. You can apply multiple tags to a single keyword if the keyword fits into more than one category. For example, the keyword “wakeboard life jacket” could have both the “wakeboards” and “life jackets” tag. Review your list of keywords in the box to the right before starting your campaign and choose if you want to receive weekly updates by email with the small checkbox above the green “Start Tracking” button. These updates will give you a summary of how many keywords your domain has ranking pages for in the top 3, top 10, top 20, and top 100 results on Google. Once you hit the “Start Tracking” button, your campaign will begin gathering data. 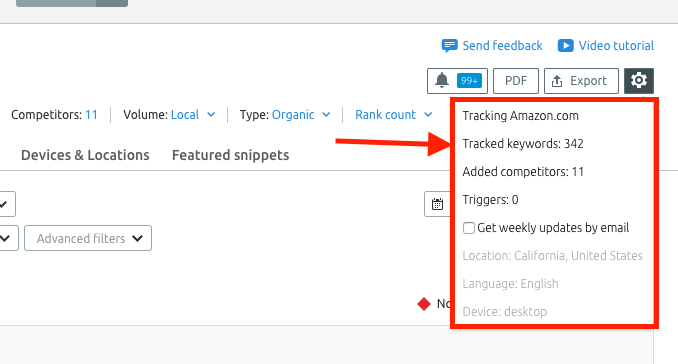 If you want to update your keyword set after your Position Tracking campaign is already set up, you can edit the keywords in your campaign with the "Tracked Keywords" option in the settings gear to re-open this step of the setup process. If you make a mistake in your set up process and want to delete your Project, all you have to do is go to your Projects Dashboard and locate the settings gear beside the Project. Deleting a Project will remove all of the Project tools, however. For example, it is not possible to delete a Position Tracking campaign without also deleting the other Project tools you set up (Site Audit, Backlink Audit, Brand Monitoring, etc. ).